What? The Closing Ceremony is tonight? Are you kidding me? It feels like you Olympians just got here, and now…now you’re leaving us?? Sure, we had a good grumble before you got here. This past year, I’d think of the Olympics with a horrified shudder. We were inundated with adverts from The Mayor of London on how sucky day-to-day life would be – we had to change our commute routes, adjust office hours (or work from home), avoid the tubes. But the day of the Opening Ceremony something changed – we embraced you. Stopped wishing we had booked a tropical holiday, and started wishing we’d gotten more tickets to the Games. What a grand ole time we’ve had, Olympians! Hollering at you riding by in those tour buses, making you pose with us for photos in the odd cafe or pub in Soho and Leicester Square, jumping to our feet in a feverish pitch of excitement at the last second of the race – in pubs, in parks, in stadiums, at home. Waving and cheering on marathon runners as you rounded the corner past St Paul’s Cathedral. Plastering our offices and cubbies (and facebook walls, phones, ipads!) with photos of you kissing gold medals, crying in defeat or victory, bowing your head as your national anthem plays. Cheering you on from every corner of London, whether or not you were ‘our’ athletes, whether or not we knew the sport. And whether or not we were British (or drunk or sober! ), rising to sing ‘God Save the Queen’ over and over and over. What do you say to that? Thanks? London is sure gonna miss you, Olympians. 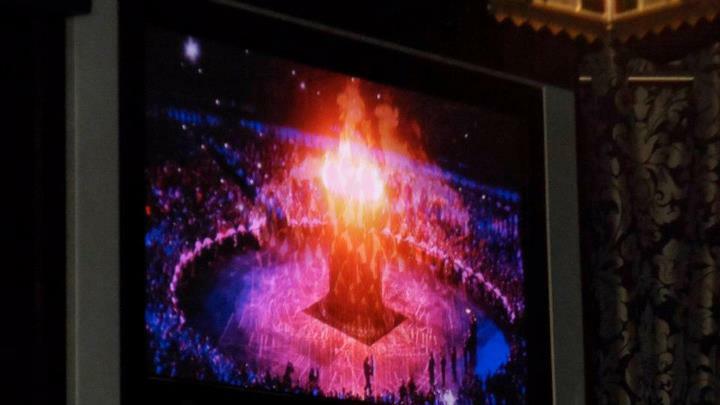 Say what you will about the Opening Ceremony of the 2012 Olympics, but you gotta admit, it was totally British. The flying, glowing bike was pretty awesome. If you made it that far in. I was stuck in a pub with die-hard Olympic friends, craning my neck over a small crowd of people steadily drinking their way through 204 odd countries parading by. So I actually got to the torch part. And the torch was spectacular.